Myth: drinking alcohol warms your body and can be used to prevent hypothermia. In fact, drinking alcohol helps lower the core temperature of your body. This myth likely got its start thanks to the fact that drinking alcoholic beverages will make you feel warmer as your blood/alcohol level rises. You can observe this dilation effect when you see people who are slightly or fully intoxicated looking flushed. This effect is more extreme in some people than others. So if you’re one of those people who gets flushed quickly when drinking even small amounts of alcohol, you’ll likely see your core temperature drop even faster than most when drinking in frigid environments. This isn’t the only bad thing about drinking alcohol when cold. According to a study done by the Army Research Institute of Environmental Medicine, drinking alcohol in cold weather also reduces the body’s ability and tendency to shiver, taking away yet another method your body uses to help keep warm when it is cold. So, bottom line, the age old practice of drinking alcoholic beverages to keep the body warm in cold weather is the exact opposite of what you should do. Archeological evidence suggest that the earliest known purposefully fermented drink, specifically beer, was made all the way back in the late Stone Age around 10,000 BC, making it one of the earliest known prepared food substance along with bread, which also dates back to around 10,000 BC. As happens quite often when people are told they can’t do something, the banning of the selling, transporting, or distributing alcohol in the United States resulted in alcoholic beverages being consumed at an estimated three times the rate it was before the banning took effect. Alternate drinking an alcoholic drink with a non-alcoholic drink. This will slow your alcohol intake rate. 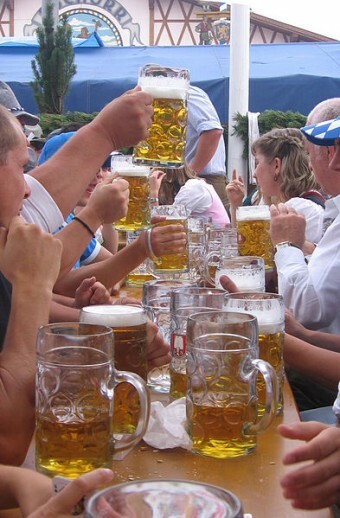 Your liver can only break down alcohol at about one American 12 ounce beer per hour. The slower you drink, the more time your body has to keep up with things. By alternating with water, you also help keep yourself hydrated and dilute the alcohol in your system, reducing irritation in your stomach and intestines. Avoid dark alcoholic drinks. These contain more congeners than “light” drinks. These congeners will up the chance of you getting a headache and experiencing other symptoms association with a hangover. Eat before and while you are drinking. Specifically, eat food with that is high in starches and essential vitamins and minerals. Avoid greasy foods as this will only contribute to an upset stomach. Drink a big glass of water before you go to bed to help rehydrate your body. Take some Vitamin B supplements to give yourself a boost in energy. Another common alcohol myth is that it’s best to let a passed out friend “sleep it off”. To be clear, if the person is actually just sleeping, that’s fine. But if they are literally passed out from excessive alcohol consumption, it is extremely dangerous to leave them to “sleep it off”, as they could quite easily choke on their own vomit, among other complications. If you see someone who has passed out from excessive alcohol consumption, it’s best to roll them over on to their side, so that if they vomit, it will minimize the risk of them choking on it. Further, they should be closely monitored and if their breathing begins becoming erratic or they do start vomiting, but don’t wake up, you should call for emergency aid. According to a study done by the University of Toronto, led by Dr. Jurgen Rehm, approximately 1 in 25 human deaths in the world is related to alcohol consumption. Further, this rate is rising steadily over the last few decades, with the primary culprit for the rise being increased alcohol consumption by women. Despite women consuming more alcohol globally than they used to, men still consume a lot more and are 5 times more likely than women to die as the result of drinking alcohol. The highest rate of deaths related to alcohol vs. total deaths is found in the countries formerly belonging to the Soviet Union, with a rate of about 1 in 7 deaths related to alcohol consumption. Overall Europe has the highest rate of deaths related to alcohol consumption of any continent at 1 in 10. Europeans drink an average of about 21.5 units of alcoholic beverages per week. This is almost double the world wide average of 12 units. While teenagers often lament their difficulty in acquiring alcohol in many nations of the world, there is a good reason for the laws outside of the often quoted reason of “adolescent irresponsibility”. Adolescents’ brains are significantly more prone to various harmful effects as a result of alcohol consumption compared to fully developed, adult brains. Harmful effects often observed in teenagers who drink frequently include an increased likelihood of developing various learning impairments and other cognitive dysfunctions, such as diminished spatial cognition. They are also more likely to see these side-effects continue long term even after ceasing consumption of alcohol. Why Does Alcohol Warm You in the Summer?